Two men were digging a ditch on a very hot day. 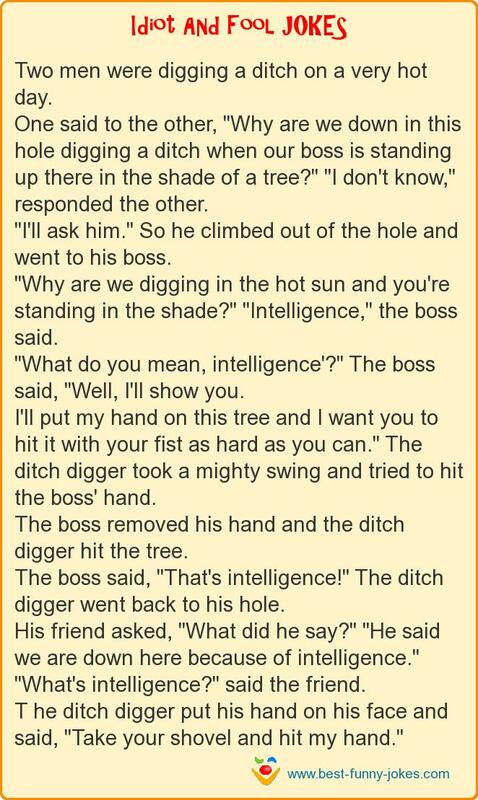 One said to the other, "Why are we down in this hole digging a ditch when our boss is standing up there in the shade of a tree?" "I don't know," responded the other. "I'll ask him." So he climbed out of the hole and went to his boss. "Why are we digging in the hot sun and you're standing in the shade?" "Intelligence," the boss said. "What do you mean, intelligence'?" The boss said, "Well, I'll show you. I'll put my hand on this tree and I want you to hit it with your fist as hard as you can." The ditch digger took a mighty swing and tried to hit the boss' hand. The boss removed his hand and the ditch digger hit the tree. The boss said, "That's intelligence!" The ditch digger went back to his hole. His friend asked, "What did he say?" "He said we are down here because of intelligence." "What's intelligence?" said the friend. T he ditch digger put his hand on his face and said, "Take your shovel and hit my hand."